Caddymatic Golf X-TREME 3 Wheel Push/Pull Golf Cart with Seat White/Green by Caddymatic at Norwalk Foundation. Hurry! Limited time offer. Offer valid only while supplies last. This is a premium golf cart with the added bonus of a built-in seat, perfect for a quick rest in between holes or whilst waiting for others to play. This is a premium golf cart with the added bonus of a built-in seat, perfect for a quick rest in between holes or whilst waiting for others to play. The high quality metal frame provides a strong support for your bag, whilst being nice and light to make moving around the course easier. Other features include an upgraded handle unit with scorecard holder, umbrella holder, storage pouch, tee holes, as well as a drinks bottle holder. 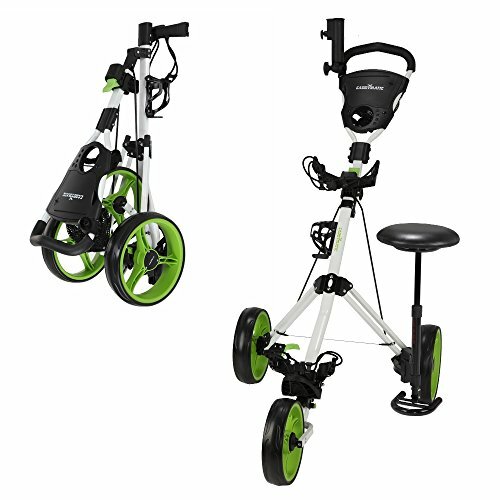 Folding up in seconds, and with quick release removable wheels, moving to and from the golf course is easy. If you have any questions about this product by Caddymatic, contact us by completing and submitting the form below. If you are looking for a specif part number, please include it with your message.